A New Zealand Long Tailed bat, by the amazing Nils Bouillard of The Big Bat Year. Photo from the The Flying and the Flightless blogpost. Hi everyone! I hope you all had a good week. I would like to dedicate this week’s blog to the people of New Zealand. My thoughts are with you all. 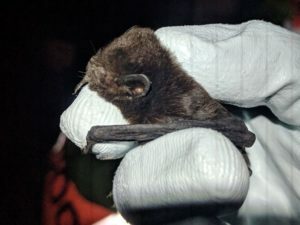 I researched some bats from New Zealand and found a cute one called the Long-Tailed bat. They have beautiful long chestnut brown hair. Long-Tailed bats have small ears and very small bodies. They are about the size of a mouse and can fit in the palm of your hand. These bats eat insects like small moths, midges, mosquitoes, and beetles. They live in forests in old trees, under peeling bark, in large hollow stumps, and other holes that they can find. Sadly, these bats are categorized as Nationally Vulnerable. This is mainly because of people cutting down old trees that these bats live in. Predators such as cats, possums, and rats are also a threat. If you would like to read more about you can find information here. And please follow The Big Bat Year, a wonderful journey being undertaken by Nils Bouillard, who is trying to photodocument as many bat species as possible in 29 separate countries over the course of a single year. He has already visited New Zealand and has written about the experience and the bats he saw. He too is a wonderful blogger, so check it out! Happy St. Patrick’s Day! Don’t forget to wear green! Next StoryLove the new place!